The diamond ring effect of the 2013 total solar eclipse is seen in this amazing photo by eclipse-chasing photographer Ben Cooper, who captured the image from an airplane at 43,000 feet on Nov. 3, 2013 during a rare hybrid annual/total solar eclipse. Editor's note: The next solar eclipse is the total eclipse that will take place on Aug. 21, 2017. It will sweep across the continental United States from Oregon to Georgia. It is a popular misconception that the phenomenon of a total eclipse of the sun is a rare occurrence. Quite the contrary. 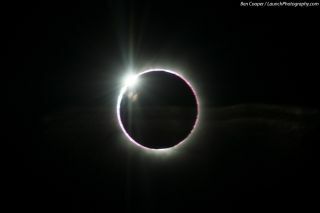 Approximately once every 18 months (on average) a total solar eclipse is visible from some place on the Earth’s surface. That's two totalities for every three years. But how often is a total solar eclipse visible from a specific location on Earth? That's another story altogether. Of course total solar eclipses do occur, because the new moon’s distance can vary between 217,730 miles (350,400 km) and 247,930 miles (399,000 km) from the Earth’s surface, on account of the moon’s elliptical orbit. Predicting the details of a solar eclipse requires not only a fairly good idea of the motions of the sun and moon, but also an accurate distance to the moon and accurate geographical coordinates. Rough determinations of eclipse circumstances became possible after the work of Claudius Ptolemy (around A.D.150), and diagrams of the eclipsed sun have been found in medieval manuscripts and in the first books printed about astronomy. But it should first be stressed that the nearly four-century wait is merely a statistical average. Indeed, over a much shorter span of time, the paths of different eclipses can sometimes crisscross over a specific place, so in some cases the wait might not be so long at all. In fact, a 40-mile stretch of the Atlantic coast of Angola, just north of Lobito, experienced a total solar eclipse on June 21, 2001, and was treated to another on Dec. 4, 2002, after less than 18 months! On the other hand, as Meeus recently discovered, some spots on the Earth's surface may not see a total solar eclipse for 36 centuries (" … though this must be exceedingly rare," he notes). On our list of 25 selected cities, how close would we come to the computed mean-frequency of nearly 400-years between total eclipses? It is too bad that Bessel's procedures were not available in the late 18th century, when Samuel Williams, a professor at Harvard, led an expedition to Penobscot Bay, Maine, to observe the total solar eclipse of Oct. 27, 1780. As it turned out, this eclipse took place during the Revolutionary War and Penobscot Bay lay behind enemy lines. Fortunately, the British granted the expedition safe passage, citing the interest of science above political differences. Williams apparently made a fatal error in his computations (or used a poor map) and inadvertently positioned his men at Islesboro — outside the path of totality — likely finding this out with a heavy heart when the waning crescent of sunlight slid completely around the dark edge of the moon and started thickening! Editor's Note: If you snap an amazing picture of the Aug. 21, 2017 total solar eclipse, you can send photos, comments, and your name and location to managing editor Tariq Malik at spacephotos@space.com.